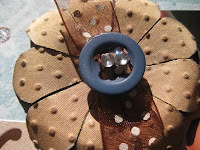 Challenge is provided by Dalis see more of her work at Dalis's Blog wonder how to give a new look to your silk or fabric flowers? Well I was wondering last week, and I came up w/ this challenge.... so come on and join us at our forum board for step-by-step instructions and some more info. here is a sneak peek of the challenge!